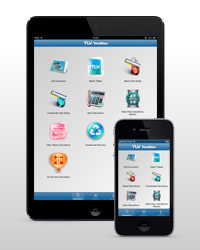 TLV International, Inc. has introduced a new steam solutions engineering app for iOS and Android mobile devices. Designed for field engineers, design engineers, maintenance, and sales engineers in the steam industry, TLV ToolBox contains an extensive range of calculations for fluid engineering. The calculations target the entire steam and condensate loop, and can be accessed offline for easy use even on-site. For steam distribution, TLV Toolbox not only covers pipe sizing, but also steam system optimization through calculations such as boiler efficiency and steam dryness from pressure reduction. A range of heat calculations for heat exchangers are available to calculate condensate load and stall point. Calculations for condensate pipe sizing in condensate recovery systems are also included.